The little sugarhouse chuffs out steam through a vent at the top. In front of it, neat stacks of locust and poplar logs stand ready to be fed into the fire that fuels the evaporator inside. Wheeler Munroe emerges from the sugarhouse wearing waterproof boots, jeans, and a T-shirt, despite the February chill at 3,400 feet on an Ashe County mountainside. The temperature inside the sugarhouse (where she’s spending most of the day) is downright tropical, with moisture hanging in the air and puddling on the floor. It’s all part of the process of creating maple syrup at Waterfall Farm, a venture she shares with her dad, Doug. While this sort of scene is common in New England, it’s practically one-of-a-kind this far south, where sugar maples are at the southernmost reach of their range. But in this little corner of North Carolina—about 30 minutes north of Boone in what are called the Amphibolite Mountains—the soil, rainfall, and elevation combine to make a healthy habitat for them. People around here have been backyard sugaring for generations, Doug Munroe says. But few have tried to turn it into a business as he and his daughter have. Then again, the Munroes have never shied from a challenge. It would not be inaccurate, says Doug, to call him a back-to-the-lander. Having grown up near Charlotte, he found himself craving the rugged lifestyle of the mountains. After moving to the Boone area for construction work, he bought a 35-acre overgrown farm with its own 40-foot waterfall at the age of 25 in 1976. “It was like heaven,” he says. Living in what was not much more than a lean-to, he cleared the land and sold the lumber for fence posts. Later, he built a house and started an ornamental nursery on the property, raising a family while raising trees and shrubs such as Japanese maples, pine, and spruce on a steep slope with views all the way to Tennessee and Virginia. A local friend who was originally from Vermont introduced Doug to the idea of tapping some of the many sugar maples on his property. He started with 10 taps and buckets he bought at Ingles. “When I tasted that first syrup,” he says, “I just couldn’t believe it had come out of my trees. It was so unbelievably good. I was flabbergasted.” The 10 taps turned into 20, then 30, then 40. Quarts of syrup turned to gallons, all boiled over the woodstove in his kitchen and gifted to family and friends. At first, Doug saw it as a fun hobby, something that he could do in retirement. It turned out, though, that he isn’t the retiring type. He traveled to Virginia and then Vermont to learn the art and science of maple syrup production. For $6, the University of Vermont’s extension service provided him with plans for his sugarhouse. “You tell them how many taps you want, and they tell you everything thing you need to know,” he says. Doug drove back from New England with a maple syrup evaporator on the back of his truck and plans for a 500-tap, gravity-fed setup. With a grant from the Rural Advancement Foundation International and help from a nephew who’s an architect, he began erecting a sugarhouse. It was built barn raising-style in just over a week during a family reunion in 2010. The first year, the 500-tap plan didn’t come to fruition: Doug maxed out at 125. “I didn’t know what I was doing,” he admits. Still, he upped it to 250 taps the following year, but then the weather didn’t cooperate. Soon, his daughter came into the picture to lend a crucial hand. Wheeler grew up mostly on Waterfall Farm but left to attend the University of North Carolina School of the Arts in Winston-Salem and later College of the Redwoods in Fort Bragg, California. She studied fine woodworking, developing her own style of exquisitely finished contemporary furnishings. Although her stint in the West was supposed to be short-term, she ended up living in Northern California for eight years, working at cabinet- and furniture-making shops and galleries. Even with the extra help, challenges loomed. 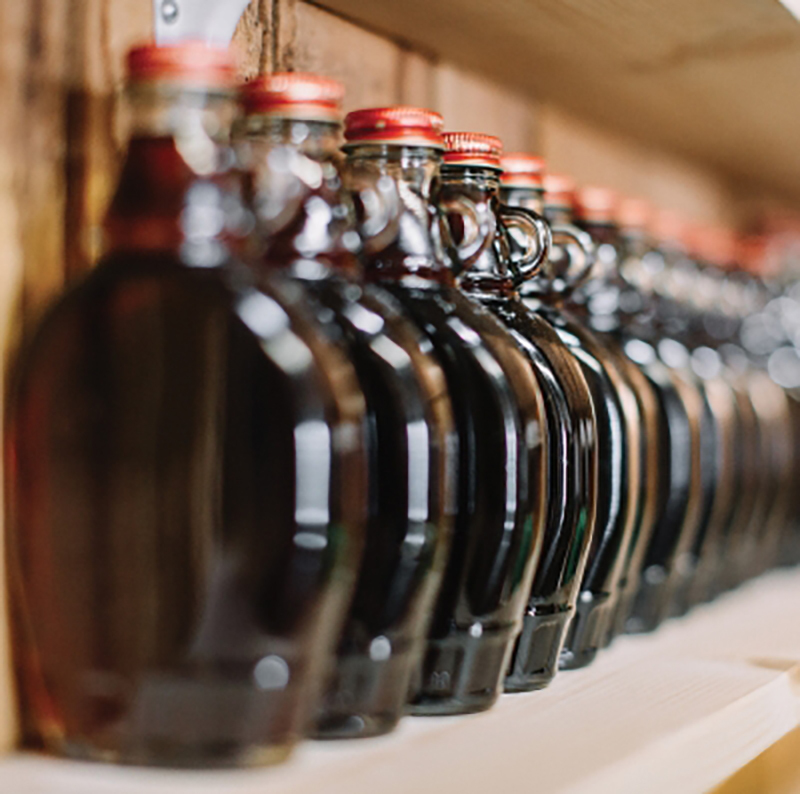 In the winter of 2013, Doug recalls, “it got warm early and stayed warm,” eating up those few precious weeks at the end of February and beginning of March when maple syrup production in North Carolina is possible. But in subsequent years, Waterfall Farm has expanded to a 450-plus tap setup with a vacuum pump that increases sap collection dramatically over the gravity-fed operation. The taps are drilled into trees, then connected to tubes that run across the property to a tank outside the sugarhouse. As Wheeler points out, maple syrup production is all about the timing. A sap run is triggered by a freeze-thaw process, which typically happens around here in early February, when temperatures dip into the 20s during the night and warm into the 40s during the day. When the time is right, there are only about six weeks to sugar before the buds start to break on the trees and the quality of the sap changes. In the Hudson Valley, where her brother Louis lives and also makes maple syrup, the season is just starting when it’s ending in North Carolina, Wheeler notes. Once sugaring starts, she says, “We have to work fast.” That often means 12-hour days during sugaring season, with Doug’s wife, Nancy, often helping out. Doug stokes the fire under the evaporator with the stacks of locust, poplar, and other types of wood harvested from the property for about 90 minutes until it’s ready to boil the sap. The fire is kept burning continuously throughout the day. As the sap comes into the sugarhouse from the tank, it’s thin, clear, and only slightly sweet. “We like to add it to bubbling water to make a light maple soda,” says Wheeler. In the evaporator, the sap is boiled, and the majority of the moisture evaporates out. Around 55 gallons of sap are processed to produce each gallon of syrup, and making that single gallon takes less than an hour. Once the syrup has been tested and filtered, it’s bottled and sealed. Syrup from these southern sugar maples differs from its northern counterpart. The sugar content of a typical New England maple syrup is around 2.5 percent, whereas Waterfall Farm syrup is about 1.5 percent sugar. But you won’t miss the extra sweetness: While the flavors and colors vary from batch to batch, industry standards require the sap be boiled down to reach a sugar content of 66 percent in the finished product. So the syrup is always delightfully rich. Every spring, the Munroes join other local small-batch producers for a taste test. In recent years, the event has morphed into a pancake breakfast fund-raiser for the Florence Thomas Art School in West Jefferson, where Doug and another sugar farmer serve on the board. Waterfall Farm syrup and local sausage and blueberries are on the menu, and home sugarers can submit their syrup to be tasted and judged. For now, the Munroes are selling their syrup directly from the farm and at the Ashe County Farmers Market in West Jefferson, open from April to October. At the end of last season, the farm had produced 85 gallons of syrup—on par with the previous year, despite having added 20 percent more taps. The lower-than-expected growth was due primarily to warm weather, says Wheeler. Now that she’s home, Wheeler intends to stay. She and Waldeck are restoring a building on the property to use as a woodshop so they can establish a studio furniture-making business, which is her long-term goal. “Being here is such a special opportunity to create my own day job,” she says, with the leather-making providing income and the maple syrup enterprise growing. Her reasons for coming back to Waterfall Farm are not so different from Doug’s reasons for buying the mountain property in the first place: to be able to create the kind of life she wants to live. With the land providing so much of what the family needs, it’s a sweet life, indeed. The Munroes' maple syrup can be purchased starting in April at the Ashe County Farmers Market or by appointment at Waterfall Farm. For details, call (336) 385-6507 or visit waterfallfarmnc.com.